Diners and shoppers at One Daytona pass small white placards stuck on glass doorways or placed near registers that alert them to a 1 percent charge on all purchases. Most probably don’t even notice the signs — or the nominal amount tacked onto their bills. The new shopping and entertainment complex across from Daytona International Speedway is one of only a handful in the state — but the third in Volusia County — to tack on such fees, which can reap millions of dollars for their owners over a span of some 100 years. Experts say it could be a growing trend. But critics see the extra fees at One Daytona and the Daytona Beach Tanger Outlets as a cash grab and a way to shift risk away from influential and wealthy developers, who were also given millions in tax breaks and subsidies. They say the fees are just another advantage not afforded to local business owners — which are unable to demand that their customers provide a virtually unlimited revenue stream for property maintenance or entertainment. There’s nothing in the law that prohibits the extra fees — any property owner can impose one, said Mark Watts, a Cobb Cole attorney who has represented the developers at all the local complexes. And the fees are not a tax, though a local circuit court judge had to rule that was so in one case. Shoppers, however, would be hard-pressed to tell the difference — as such fees are masked in quasi-government language and charged after the sale, providing cover for these complex’s restaurants and nationwide retailers, which would otherwise have to raise prices because the ultimate responsibility for paying the fee falls on them. At the Tanger Outlets, a 0.65 percent surcharge is dubbed a “public user” fee. At the Pavilion at Port Orange, hunter-green signs discreetly placed near bushes or trees call the 1 percent charge a “public infrastructure” fee. At One Daytona, it’s called an “enhanced amenity” fee. Because the fees are private, there is no state or local agency to keep tabs on them. A search of news articles found only three other complexes in the state with this type of charge on all sales. The fees at The Pavilion have already brought in nearly $4 million since it opened in 2010. The fee at Tanger Outlets could generate nearly $1 million annually, and One Daytona’s fee could soon rake in $2.15 million a year, according to retail sales projections made before the complexes opened. To understand how these fees came to exist, it’s necessary to track back through a complicated series of public-private agreements and court filings. Understanding how the fee money gets spent is even more difficult. What is clear, however, is the revenue from these fees will not benefit local governments that helped developers build the shopping centers by granting special entities, along with, in some cases, providing funds and tax incentives. City governments established for the developers what are called community development districts, which have unique powers to pay for and maintain infrastructure like roads, sewers and water management systems. Volusia County and Daytona Beach also gave Tanger Outlets $4.5 million in grants. They gave One Daytona $40 million in grants and tax incentives. All the money flows through the special districts. The fee money that’s collected, meanwhile, goes back to subsidiaries of the malls’ corporate owners. Neeb said that the fee would also pay for “project enhancements.” A subsidiary of ISC has control over how the cash is spent. The notice of the fee stirred several of his readers, he said, and it has caused him to avoid One Daytona altogether. “I don’t think there is any justification for adding that fee to the products and services, given that we have underwritten this to the tune of $40 million in public funds,” he said. Barker said his objection goes beyond dollars and cents. Now it will have to compete with Kilwins, a national franchise set to open at One Daytona that will benefit not only from the public outlays given to the complex but also the enhanced amenity fee. What can residents do about these fees? Nothing, short of not shopping at these complexes, said University of Florida professor Joseph W. Little, who teaches local government and tax law. The only way the fee could be challenged is if it’s built directly into the sales tax, he said. The first appearance of these fees in Volusia County was in March 2010, with the opening of the Pavilion at Port Orange, an outdoor complex with some two dozen stores, several restaurants and a cinema. Revenue from the Pavilion’s 1 percent fee is pledged back to a community development district, known as a CDD. Such districts are special-purpose governments that can be established by city or county ordinance on a piece of land for “the simple, single purpose of managing the provision of infrastructure,” said Kenza van Assenderp, a Tallahassee-based attorney who co-authored the state legislation creating such districts. These districts have a number of requirements, such as being subject to the Sunshine Law, having a board and manager, holding public meetings, and ensuring competitive bidding, for example. The vast majority of CDDs are residential developments, said Jonathan Johnson, a senior lawyer with the Tallahassee firm Hopping, Green and Sams, which focuses on special district work. The best known in Central Florida is The Villages, a giant retirement community south of Ocala. Of the more than 600 CDDs in Florida, Johnson estimated that there are likely fewer than 10 attached to commercial developments. There are three in Volusia County. “It’s not widespread,” said Johnson, who was not involved in any of the local developments. But he said that it’s likely to become more common. When it comes to infrastructure, CDDs have several roles, including overseeing construction and long-term maintenance. But it’s their financing abilities that developers and local governments find most attractive. The way it works in most cases is these districts pay for their infrastructure by selling bonds to investors. To pay off the bonds, the districts levy assessments — liens on the property. The assessments are then paid by the landowners. The usual benefit to the wider community is that it does not have to pay for roads, sewers, street lighting and water, which are provided and maintained by the district. This, however, is not the case for One Daytona or Tanger Outlets, both of which received public funds. There are unique risks when CDDs are used for commercial developments, said Richard Lehmann, who runs an independent investment advisory and research firm and tracks CDDs as part of his Distressed Debt Securities Newsletter. Unlike with the complexes in Daytona Beach, the city of Port Orange did not commit any up-front tax dollars for the development of the Pavilion. Its infrastructure, which included the widening of Williamson Boulevard to four lanes and sewer and stormwater management systems, cost $16.1 million. To pay for it, the district, headed by the Pavilion’s developers, issued a $14.3 million bond in 2010. To issue bonds, a CDD must have them validated by a circuit court judge, and it’s the job of the State Attorney’s Office, which is normally prosecuting crimes, to represent the interests of taxpayers. In a filing from June 2008, the Pavilion’s district, called SWI Community Development District, asked a judge to agree that it could accept what it called “The Pavilion at Port Orange User Fee.” It’s here where it’s explained how the fee is imposed. The fee is put in place by a private deed filed by a subsidiary of the landowner, Tennessee-based CBL & Associates Properties Inc., one of the largest owners of shopping complexes in the South. That deed requires all of the Pavilion’s retailers to collect the 1 percent fee on all sales. In the filing, SWI CDD’s lawyers asked the court that the district be allowed to accept the fee to pay its bonds. In doing so, it had to prove that the fee wasn’t an indirect sales tax, which would be illegal. An amended filing four months later, however, scrubbed all mention of the user fee, and in its stead were placed special assessments. Still, once the Pavilion opened in March 2010, its retailers began to collect the fee to pay the interest on the bond. One of the small retailers at the new shopping complex was Adornments, a boutique owned by Laurie Schammel, who took a gamble by opening a second shop there. Schammel said she hadn’t known that she had to charge the fee until her lawyer pointed it out in the lease. It wasn’t mentioned by the leasing agent either. Though the fee amounted to just one dollar on a $100 purchase, it bothered her customers, many of whom had shopped at her original store in Ormond Beach where they didn’t have to pay it, she said. She ended up leaving the Pavilion after five years. The fee was not why she shut her second shop, but it did hurt her business, she said. In 2016, SWI CDD’s lawyers asked again to have the revenue from the mall’s user fees accepted to pay off its bonds. This time the issue of whether the fee was an illegal sales tax made it in front of Seventh Circuit Court Judge Dennis Craig. The proceeding lasted 20 minutes. Judge Craig was unable to comment on the reasoning behind his decision because he is barred from doing so, said Ludmilla Lelis, spokeswoman for the circuit. Assistant State Attorney David Smith, who represented Volusia County taxpayers at the hearing, also did not return emails requesting comment on the case. According to financial documents from 2010 to 2016, SWI CDD has collected more than $3.9 million from user fees since the Pavilion opened. The money wasn’t enough to pay all the interest on its bond, which came due in 2015. Another bond was issued in 2017 to repay the initial one, according to the district’s most recent financial statement. It has a longer lifespan and will be paid off with user fees, Watts said. “Now all the principal on the note is being paid down with the revenue coming in,” he said. Watts said the bond is anticipated to be paid within 30 to 40 years, but the landowner decides when the fee comes to an end. According to the land deed, the fee is scheduled to continue for another 90 years — until 2109. Tanger Outlets and One Daytona are the latest shopping complexes in Volusia County to add a fee on all sales at their shops and restaurants. It’s difficult to say how many others within Florida are tacking on similar charges. A search of Google and other news libraries found mentions of only three other shopping centers in Florida that impose similar fees: Celebration Pointe in Gainesville, Ravaudage in Winter Park, and Hammock Landing in West Melbourne. Watts, the local land-use attorney, has been involved in all except the one in Winter Park, records show. CBL — the owner of the Pavilion, as well as the Volusia Mall — has used a half-cent sales tax at a shopping complex in Kansas, and there is a 1 percent user fee at a Tanger Outlets in Alabama, according to news reports. In those cases, however, the local governments agreed to the add-on charges. That didn’t happen at the local commercial developments because the fees were imposed by the owners through private deeds — not by any government entity. Though imposed the same way, the fees at the local shopping complexes have some significant differences. The fee at Tanger’s stores is lower by 35 cents — only 0.65 percent. But the landowner, a subsidiary of North-Carolina based Tanger Factory Outlet Centers Inc., can increase it to 1 percent, according to its land deed. 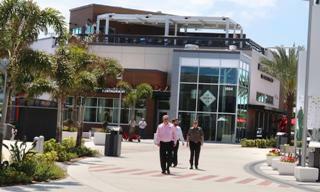 Daytona Beach and Volusia County governments gave $2.25 million in grants to help build the $100 million outlet mall. According to the district’s 2016 financial statements, the CDD, known as Tomoka Town Center, has received all $4.5 million in government funding. The outdoor mall’s 39 acres were bought from Consolidated-Tomoka Land Co., which asked the Daytona Beach City Commission to establish the CDD on some 200 acres encompassing the outlets. When Tanger Outlets was looking for financial help from the city and county, Consolidated Tomoka’s John Albright said the shopping complex could provide “more than $120 million in sales revenues per year.” At that amount, the fee would generate more than $780,000 annually. The fee’s revenue, however, is not pledged back to the CDD. Instead, the money, which is said to be earmarked for infrastructure, is administered by limited liability companies attached to the outlet mall’s corporate owners, according to the deed. At One Daytona, signs describing the 1 percent fee are posted at the complex’s large retailers, such as Guitar Center and the Bass Pro Shops store; small shops, such as Ben & Jerry’s ice cream; and all its restaurants, such as P.F. Chang’s. No signs could be found at the Cobb Daytona Luxury Theatres, but the cinema charges the fee on all concessions, adding it to the sales tax. An executive for the company said both issues are being corrected. The sales manager of the newly opened Fairfield Inn & Suites by Marriott said that the hotel does not collect the fee. The fee’s revenue, however, does not pay for public infrastructure that would, in theory, benefit the community. According to the land deed, the fee can be spent on One Daytona’s multimedia displays, sound systems, promenades, performance spaces, interactive fountains, wireless broadband and any other related private infrastructure. All the cash goes directly to a subsidiary of International Speedway Corp. — not its CDD, called One Daytona Community Development District. “One of the things they have done successfully at One Daytona is they brought a new level of development to the market in this area,” Watts said. To do so, it was decided that the fee’s revenue needed to go to uses other than infrastructure. The county and the city won’t see any of that money, though both provided infusions of cash for One Daytona’s infrastructure bill. The county gave $20 million dollars in grants, based on future sales and property tax revenue. The city gave an initial $2 million through reimbursed impact fees, and its remaining $18 million comes from property tax rebates. Like at the Pavilion, One Daytona’s CDD went before a judge and asked permission to issue $53 million worth of bonds for infrastructure costs. It uses both the outlay by the city and county and the imposition of special assessments to secure the bonds. There is no mention of the enhanced amenity fee in the filing because “it wasn’t part of what we had to do to make everything work for that project,” Watts said. Yet back in 2014, when the project was getting underway, one of the arguments that a developer made for needing public funds was that a fee would not cover infrastructure costs. Dinneen said that the idea of a fee never factored in the County Council’s decision to provide $20 million toward the development. “We had no connection to it and never took an opinion on it all,” he said. The developer “might have made the comment in there, but that did not come up at all in the discussion with us. A funding gap was also not part of the equation, he said. He said that the guarantee the council would see its investment returned came in the form of certain restrictions on receiving all the funding. “Our grant was you need to do the following things to get paid, you have to make the following changes, and then we will collect our taxes back,” he said. According to the district’s 2016 financial reports, the county’s $20 million has already made it into the district’s coffers. Daytona’s Chisholm said that the developer who wrote the letter ultimately left the project and that “other options were chosen” to secure the city’s $18 million. The outlays come from future tax revenue generated from One Daytona’s rising property values. This all comes at a time when ISC is making hundreds of millions of dollars and is valued at nearly $2 billion on the NASDAQ stock market. Last January, ISC saw its revenues rise to $671.4 million, the highest since the 2008 recession. According to ISC’s 2017 financial report, it has spent a total of $80.3 million on One Daytona. This year and next, it plans to spend another $27 million on the shopping and entertainment complex, with much of that money going to developing a retail area known as the Shoppes at One Daytona, whose businesses will likely also assess the fee. In the report, ISC told investors that once completed, the first phase of One Daytona and the Shoppes is expected to generate a revenue of $13 million annually. A second phase of the project has still yet to be built. That means that the fees at One Daytona could generate between $2 to $10 million each year. According to court documents, the fee will continue to be collected until 2116 — another 100 years.